MARTHA MOMENTS: Living for i-Pad is Launched! Living for i-Pad is Launched! 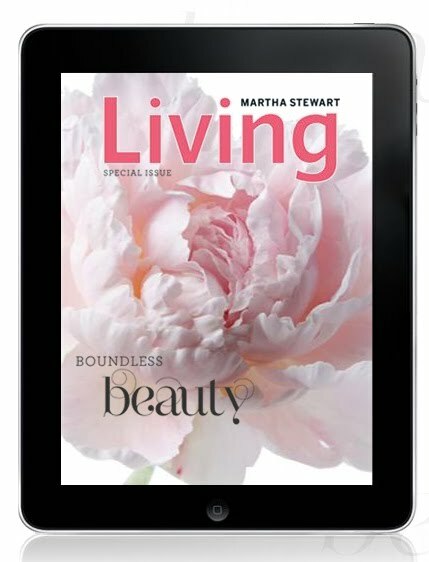 Today marks a very historic day for Martha Stewart Living magazine: the launch of their first digital issue! It is now available for download (i-Pad only) and contains exclusive content not found anywhere else. The magazine features astonishing animation (peonies blossoming before your eyes, bubbles floating by) beautiful photography, more than 23 new recipes for delicious dinners and desserts, 20 slide shows with step-by-step instructions, five exclusive behind-the-scenes videos and four panoramas, including one of Martha's farm in Bedford. - A slide show of Martha's early years: her modeling portfolio and her first home, cooking, and gardening projects. Plus, listen to an interview with a fellow creative guru. - Take a panoramic 180-degree tour of Martha's peony garden and watch a video of how she makes her spectacular arrangements. - Experience the untouched Alaskan landscape with its glaciers, mountains, and rugged shoreline; ride along with a salmon fisherman on the pristine Copper River; and learn new recipes to make wild Pacific salmon at home. - Go glam: Get a holiday makeover with our festive product picks. Toggle between before and after shots to see the stunning transformations. - Be jeweled! Learn how to make fantastic plastic jewelry using not much more than polymer clay, your oven, and a few basic molds. Click here to learn more about the digital magazine as well as watch a behind-the-scenes video about how the issue was put together. 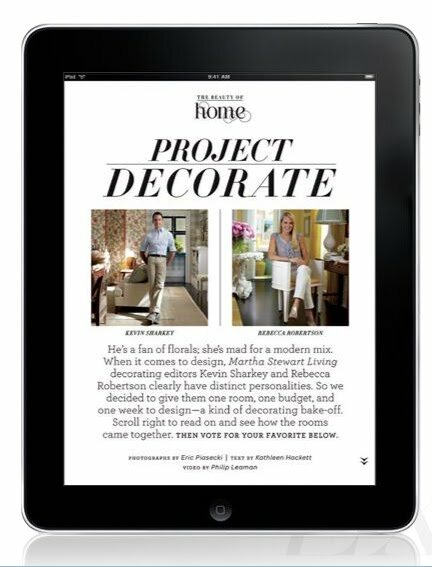 Click here to download the magazine to your i-Pad for just $3.99! Get inspired for your next celebration—with bubbles! Fizzy drinks and floating decorations plus sweet and savory treats add up to an effervescent atmosphere. After touring Martha's peony garden, view an incredible glossary of these lush flowers and learn about how to grow each variety. Find out what happens when two decorating editors go head-to-head, then vote for your favorite room and get live voting results. But I am very excited about this. I can't wait to read reviews on it which I am sure will appear very soon. 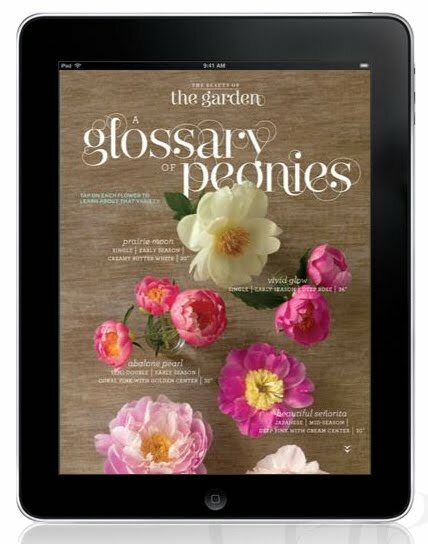 It looks wonderful, and I must alert all my friend who have ipads.Just an observation, Martha seems overly obsessed with peonies. Not that there's anything wrong with that - they are a gorgeous flower. It's just that there seems to be an inordinate amount of attention paid to this species, and not everyone is in a zone/climate/soil to grow them. I downloaded this app yesterday - thanks to reading about it on Martha Moments! Its definitely very Martha and the peony unfolding on the cover is amazing. So are the panorama views of her peony garden. I actually read alot of magazines on my iPad now but leave it to Martha to create a brand new experience. Hope this is only the first of many from Martha.